I don't recognise my child. Yesterday he was a sweet, polite boy who smiled a lot. Today he mumbles in monosyllables, shouts at his sister, and never comes out of his room except to raid the fridge. Think of a storm. Think how it builds - brooding slowly, dark with ominous clouds and flashes of lightning and rumbles of rolling thunder that may erupt at any minute. Then a torrent of rain, perhaps a few hailstones and finally, the sun comes out - as if the storm had never been. Adolescence can be just like that: a powerfully disruptive, often chaotic and yet a wonderfully vivid and energetic time. As parents, we can do a lot to manage the impact of this sometimes confusing and challenging time in a young person's life. Standing firm and holding on to one's values in the face of bombardment from adolescents, who in turn are facing their own pressures of identity and self doubt, requires a clear head, encouragement...and a handbook. 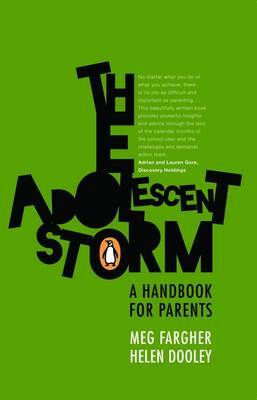 The Adolescent Storm is that handbook. This handbook will: give you a clearer insight into the process of healthy, age-appropriate adolescent development; help you to understand and enjoy the process of guiding your adolescent through these years; help you to enjoy a deeply connected and relevant relationship with your child from adolescence into adulthood. Thoughtful - not perfect - parents can create thoughtful adolescents and in turn thoughtful, responsible adults who are well integrated in society.